Pickerel, yellow pike, colored pike. Walleye are typically dark olive and yellowish-gold in color with a white underbelly. In certain parts of Canada, they tend to have a more greenish-grey coloration. They possess a spiny dorsal fin and many sharp teeth, but its most distinguishing characteristic may be its marble-like eyes that reflect light, allowing them to hunt at night. Walleyes can grow to be over 35 inches (89 cm) and weigh up to the 20 pound (9 kg) range. The largest ever caught was 42 inches (106.7 cm) and weighed 25 pounds (11.3 kg), caught in Tennessee back in 1960. Found throughout most of Canada and northern and eastern United States, going as far south as Alabama. Walleye prefer intermediate temperatures of water, meaning they don't share the same enthusiasm for cold water as trout do, or warmer waters that bass prefer to swim in. The murkier the water, the better for walleye as it makes hunting for smaller fish easier. Walleye will swim in clear water as well, but prefer to hang around river mouths if possible. Depends on where the walleye grows up. In southern waters, walleye grow at a much faster due to the longer, warmer seasons, but tend not to live past 10 years of age. 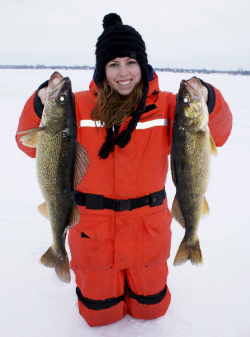 In colder waters, walleye grow slower but can live to see 20 years. A formidable predator that feeds on yellow perch, minnows, crayfish, andms, and insects. Walleye tend to feed at dawn or dusk and rarely swim during the day, though in overcast conditions walleye do come out to feed as well. Males reach maturity between three and four, with females tasking an extra year. Walleye spawn in early spring on rock or gravel, primarily where there's a current that can bring oxygen to the eggs. Spawning locations are usually in shallow areas very close to shore. Walleye have few natural predators, but bigger-sized muskie and especially northern pike will take a bite out of a walleye that's small enough. Credit for Information above: Fisheries and Oceans Canada. Gord Pyzer has years of experiences writing and presenting seminars about catching walleye. Below are his favorite patterns for putting huge numbers of walleye into the boat. Gord is WFN's Central Canada Expert, as well as the Fishing Editor of Outdoor Canada Magazine; Field Editor of In-Fisherman Magazine and Television; Co-Host of the In-Fisherman Ice Guide television series, Co-Host of the Real Fishing Radio Show and Host of Fish Doc With The Doc on the Outdoor Journal Radio Show. What can I say? 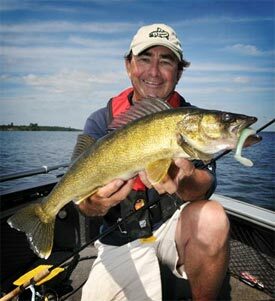 More walleyes have likely been caught on a jig and live bait presentation than all other lures and baits combined. Jigs are that deadly. The reason, of course, is that a jig is unobtrusive, yet by changing its weight - from 1/16-ounce for shallow water all the way up to 3/4-ounce for deep water or heavy current - you can cover all the various options. Plus, when the walleyes are color conscious, you can select a hue to turn them on. As for live bait options, the cardinal rule is to use minnows in the spring and fall when the water is cold. Leeches often become better when water temperatures warm into the 60s and 70s, while nightcrawlers reign supreme in the warmest water. Still, I like to carry all three bait options and let the fish tell me what they want to eat on the end of my jig on any given day. Walleyes eat spinner rigs or crawler harnesses, call them what you will, with a vengeance. Single hook harnesses are ideal for leeches and minnows, while two and three hook harnesses team up best with nightcrawlers. Just be sure to experiment with blade shapes, sizes and colors. Willowleaf blades spin the fastest, emitting plenty of flash, but they are also the most silent. Colorado blades, on the other hand, spin much more slowly but they thump aggressively. Indiana blades are somewhere in between, making them ideal choice for starting the day. Large blades are ideal in dark and dingy water, when you need to call out to the walleyes to let them know that dinner is ready. Large blades are best, too, when the fish tend to be on the bigger size. Don't discount smaller blades, however, when the water is clear and the fish are in a funk. Finally, nothing allows you to present a spinner rig better than a bottom bouncer. Just don't drag the bouncer. Let out line until you can feel it just ticking the bottom every so often. This means you're trolling your harness in front of the fish. Slow Death fishing for walleyes is sweeping the country because it is so deadly. In times past, walleye anglers were fanatical about attaching their baits perfectly straight so they didn't spin. How times have changed. Slow Death involves using a hook (Mustad makes the most popular Slow Death hook, although many anglers prefer a #2 Aberdeen Tru-Turn style) with a distinct bend to it. Then, you thread on your nightcrawler (a live crawler works well but a Gulp! or Trigger X worm is often better) so that the head covers the hook eye and the body takes on the shape of the hook. Then you snip off the crawler so that only an inch or so is hanging behind the bend of the hook. It is best to use a three to four foot long, 10-pound test leader behind a bottom bouncer and troll at about 1-mile an hour. The finger-size crawler chunk spins like a corkscrew that the walleyes can't resist. As for depth control, the standard rule of thumb is to use a 1-ounce bottom bouncer when you're fishing in 10-feet or less of water, a 2-ounce bouncer in 20-feet of water and a 3-ounce bouncer in 30-feet. But these are only starting points, so don't hesitate to experiment. I have caught more walleyes over ten pounds the last 7 or 8 years on swimbaits than all of the other walleye options combined. And you won't believe how we're rigging them. We're using 1/2-, 3/4- and 1-ounce saltwater style bullet shaped jig heads. Five and six inch swimbaits (X-Zone Swammers, Berkley Hollow Belly and Split Belly Swimbaits) work best. You also need to use a 7-foot long, medium heavy action spinning rod spooled with a quality 14-pound test braided line (Sufix, Fireline or PowerPro). Then use back-to-back uni-knots to attach a two to three foot long 15-pound test fluorocarbon leader. Because of the weight of your terminal tackle you can cast this set up a mile and it sinks quickly. After it hits the bottom, lift up your rod tip and start swimming the lure back to the boat. You want to keep it within a foot of the bottom at all times, ticking it occasionally, as you drop your rod tip to pick up line. That slight pause is also when 90-percent of the walleyes will eat your bait. It is quite simply the deadliest big walleye pattern known to man. In the summertime, when the living is easy, one of the most predictable walleye patterns - for numbers as well as trophy size fish - is to search out shallow, rocky structures like underwater points, reefs and rock piles. The best are often the "sea gull rocks" that just barely break the surface of the water. And they come into their own when the wind is blowing onto them. Under the waves, the walleyes will sneak up shallow, even in the middle of the day, and feed aggressively. So there is no need to tippy-toe around with this presentation. Select a crankbait that will run slightly deeper than the water you're fishing. That way you will attract and trigger walleyes as you bang bottom and ricochet it off the rocks all the way back to the boat. It is that simple. Cast your crankbait up shallow and start your retrieve, stopping for a second or two, every time you feel your crankbait hit a rock. Walleyes typically devour it as it rises up and over the obstruction. The key, of course, is using a crankbait (my favorite is the time proven Rapala Shad Rap) that is buoyant enough to float up and over the rocks when you pause the retrieve. What Makes Walleye Fishing Fun? Walleyes may not put up as big a fight as other game fish, but the challenge of finding the right lure and presentation to get them to strike makes them a fun fish to go after. Asking around for guidance is smart with walleye because they are certainly a wily fish that have more than a few tricks up their sleeves. The rewards can be worth it for if you're looking to eat what you catch as walleyes are one of the best tasting freshwater fish out there.Walleye are nocturnal fish, so fishing at night, or dawn or dusk, offers the best chance of landing this popular fish. One of the better sights of freshwater fishing is reeling up a walleye at night and seeing its eyes flash as you bring it closer to the surface. Because walleyes have such sharp teeth, precaution is necessary, especially when taking kids out to fish for them. Kids will love trying to tackle this fish, but just be careful they don't get too close to the mouth. Just to be safe, always have a first-aid kit with bandages handy. You should have no problems so long as you're safe. Where Is Walleye Fishing Possible? 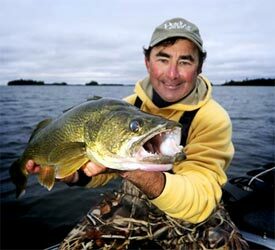 It is not uncommon to see people going for rather big fish by shore fishing walleye along lakes and rivers. They tend to prefer slower moving and darker water, and the more bait fish in that body of water the more likely the walleye population is healthy. In the States, lakes in Michigan, Wisconsin, and Ohio offer some of the best walleye fishing in North America. Lake Erie walleye fishing is one of the most popular walleye hotspots in the world, particularly spring-time fishing in the Western Basin of the Detroit River. In Canada, walleye is at its best in the many lakes and rivers of the province of Ontario. 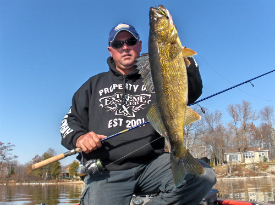 The Bay of Quinte in Lake Ontario, for example, offers trophy walleye throughout the spring and fall months. Ice fishing walleye is another popular choice, with the French River being one of the best locations in Canada. If you are going after these big guys you definitely want to make sure you read up on your walleye fishing techniques. There are many different schools of thought when it comes to walleye fishing lures so you will need to decide which is going to work best for your situation. Gord Pyzer's five tips above are a great start and is sure to get you plenty of walleyes. Another option includes trolling with crankbaits, especially those shaped like minnows. As mentioned above, jigging with nightcrawlers, minnows, and leeches are ideal live bait choices. Shiners have become one of the most popular species of minnow for walleye, but be careful when using them for ice fishing. Shiners do not do so well in the cold and you may be better off sticking with other species. Walleyes enjoy feeding when their prey is at the weakest visually. This means twilight is the best time for fishing as the transition between day and night wreaks havoc on fish with lesser sight in the water, which is precisely what a walleye wants. In addition, the choppier the water is the better. Anglers refer to this kind of water condition as "walleye chop", as the unruly conditions make for better hunting for the walleye. If you're going out at twilight and there are waves in the water, you're as good as gold for catching walleye. Finally, getting the advice of a veteran who has plenty of walleye fishing tips will only make you become a better angler. The more you pick up, the more you'll bring in.